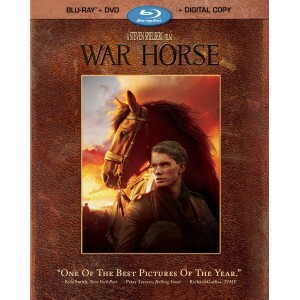 Bryan Reviews ‘War Horse’ Blu-Ray!!! In never got a round to catching Spielberg’s ‘War Horse’ in the theatres. I heard a lot of people enjoyed it, but it really wasn’t at the top of my list. Overall. I enjoyed the film quite a bit. It’s done very well on ever level, but that’s Spielberg. I really expected a movie about horse, but it was more about the different characters the horse encounters during the war and how the horror of war-times effects each individual. The audio and video on this bluray are top notch with a few good extras. If you were a fan of the film, a Spielberg enthusiast, or a war movie buff, then this bluray is for you. As I said above, the horse is the backdrop of the film that links all the characters together. This is not really a film about a horse really, but rather a story of several characters involved in war. The horse is named Joey and he almost didn’t become to be in existence. As if it were all an accident. Joey is bought by the town drunk at an auction. He was to buy a strong thoroughbred horse, but he ended up with Joey. The drunk’s son, Albert takes a liking to Joey and teaches him to plow the farm which would be extremely hard for a horse like Joey. Overtime, Joey shocks everyone and does the impossible. He plows the farm. While the farm isn’t doing well, the drunk is forced to sell Joey, and the beloved horse is sold to the army. From here, Joey is passed along through different people during the war. He comes across Captain Nicholls (Tom Hiddleston), a couple of German soldiers who have defected to the other side, a young french girl and her old grandfather, and an animal handler amongst others. And through Joey, we see how war has changed these different people. These characters seem to have lost everything, but when they come in contact with Joey, they seem to forget everything and the world becomes beautiful again, if only for a few moments. 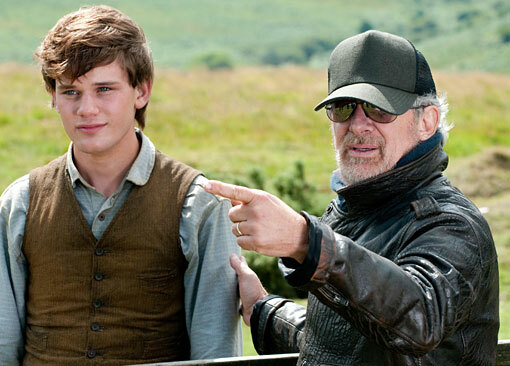 Spielberg does a great job with ‘War Horse’ in getting you to express all your emotions on the frontline. It’s very tender and affectionate at times and with John Williams’ score, it just amps up your emotions to the 2nd degree. This is based on Micahel Morpurgo’s novel and does the book justice. I know it was adapted in to a stage play too and would love to see that on stage and compare it to this epic movie. There is nothing really new in the way of filmmaking or storytelling here. It’s your usual Spielberg film with tons of tears, joy, and good feelings. There are plenty of montages to go around and the score is as always with John Williams, Amazing. While ‘War Horse’ isn’t a film that I would watch over and over, it really does a great job of keeping you interested and forms a bond with you and Joey. I wouldn’t be surprised that over the next year, sales in horse go up. The video presentation is incredible on ‘War Horse’. The film is presented in 2.35:1 in glorious 1080p high definition. The detail of ‘War Horse’ is utterly fantastic. You could be watching a wide shot of a war torn land, or beautiful landscapes of the countryside and be overwhelmed of the beauty on how ‘War Horse’ was shot. You can see every cut, scrape, piece of dirt on every character and the horse. Even the shot where we get the point of view from Joey is amazing. I did not notice any aliasing or banding. The colors were bright and vibrant, even in the bleak war scenes where smoke fills the screen. This is a demo worthy disc. 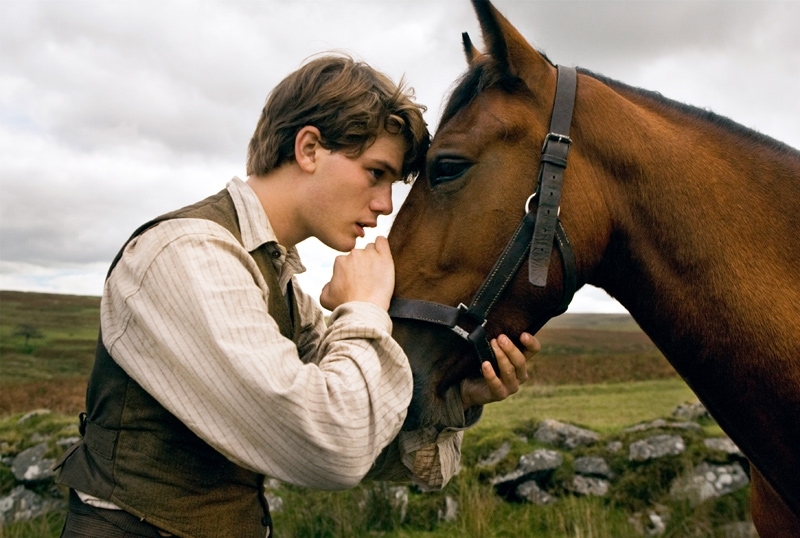 ‘War Horse’ packs a powerful DTS-HD lossless 7.1 audio mix. My speaker system got a full work out with this audio mix. The dialogue is crystal clear and the war scenes come full force with thunderous explosions, and tons of hard booms. I actually felt like I was at war for a second. Plus John Williams’ score boasts evenly and loud through everything. The ambient sounds of bugs, gunshots, bombs, and galloping horses come across nicely on the surround speakers. I did not notice any cracks or hissing in any of the audio. If you want to blow someone’s mind on how good your sound system is, then put this disc in. It’s very much demo worthy. Excellent presentations of both video and audio on this release. ‘War Horse’: The Journey Home (HD, 20 min.) – Spielberg himself hosts a couple of roundtable interviews. One with he cast and one with the crew. They all go over some aspects of the film and how they made ‘War Horse’. An Extra’s Point of View (HD, 3 min.) – Martin D. Dew who was an extra on the film talks about the making of the movie through his eyes and how many character he played as an extra. This is an amazing feature and would love to see more of this on future releases. A Filmmaking Journey (HD, 1 hr. 4 min.) – Here is an hour long behind the scenes feature that will satisfy any die hard fan of the film. PRetty much everything his covered in this mini documentary on the film. Editing & Scoring (HD, 9 min.) – John Williams and editor Michael Kahn talk about the score and music of the film and how it was edited in the film. Spielberg also makes an appearance and expresses his love for both Williams and Khan. Anything with John Williams is gold. The Sounds of ‘War Horse’ (HD, 7 min.) – Sound designer Gary Rydstrom speaks about the sound editing of ‘War Horse’ and what it is like to work on a big budget picture with Spielberg. Pretty cool. Through the Producer’s Lens (HD, 4 min.) – Long time Spielberg producer Kathleen Kennedy goes through some images and talks about the film. This was okay at best. They really knocked it out of the park with this blu-ray. The audio and video are marvelous and the filmmaking is great as always. While ‘War Horse’ might not be one of Spielberg’s most beloved works of film, I can see why he chose to make this movie and it shows on screen. The extras are pretty decent and I think you’ll get a kick out of this film. If you were a fan, then pick this up. But its $29.99 price tag is pretty hefty. Yes, you get the bluray, dvd , and digital copy, but if you are on the fence about it, wait till it’s under $20. This entry was posted on Monday, April 23rd, 2012 at 9:41 pm	and is filed under Film, News. You can follow any responses to this entry through the RSS 2.0 feed. You can skip to the end and leave a response. Pinging is currently not allowed. « Mel Gibson Will Join ‘Machete’ Sequel, ‘Machete Kills’!! !